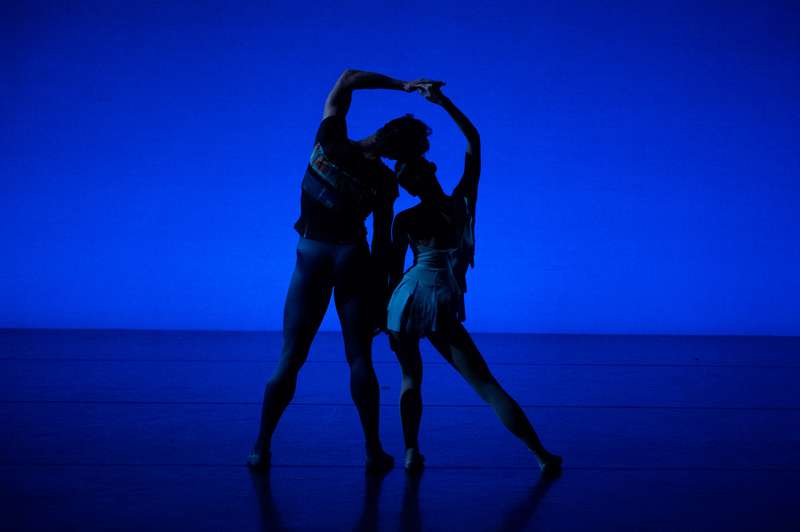 Rarely these days do ballet companies place large bets on emerging choreographers, particularly female choreographers. Rarely do the East and Left Coasts of dance acknowledge each other's existence. And rarely do ballet companies take enormous musical risks. 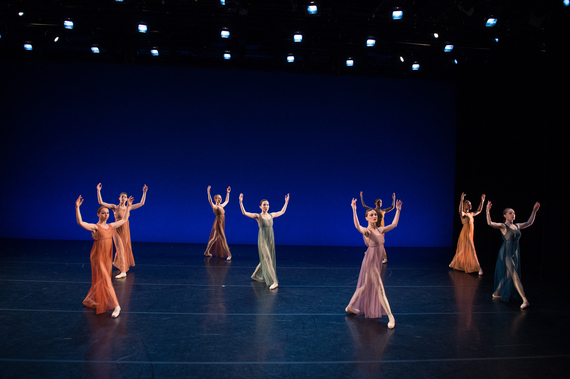 This season, New York Theatre Ballet has done all three, raising the roof at New York Live Arts with a mixed bill that defies the rules of dance programming, and that vaunts the creations of three young choreographers, two of them women, against the work of titans. 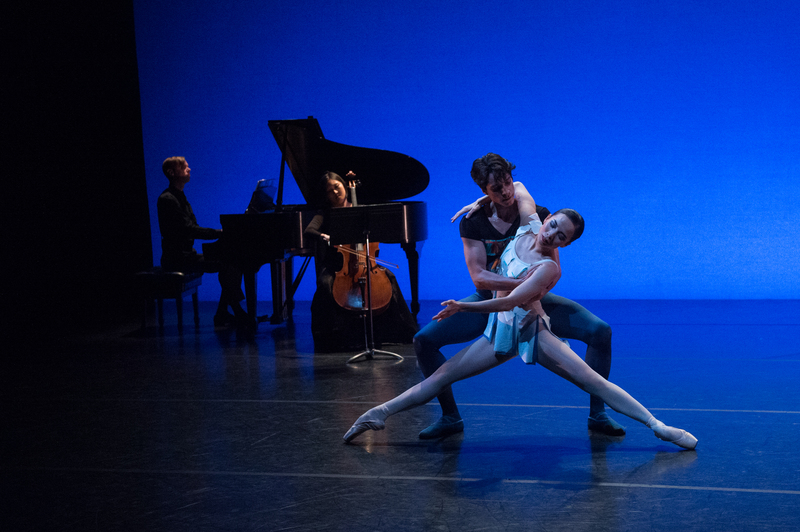 The evening opened with Chemical Bond, a diverting trio for Joshua Andino-Nieto, Amanda Treiber and Mayu Oguri. The work of San Francisco-based choreographer Milissa Payne Bradley wittily evokes the thermochemical reaction that produces water - without getting tiresomely literal about it - thereby conveying a whimsical and poignant parallel to the dynamics of intimate human encounters. The engaging Andino-Nieto portrays the oxygen atom, drawn to hydrogen ions Treiber and Oguri. The women's vibe suggests opposing spin isomers, one intrinsically more unstable and excitable than the other. 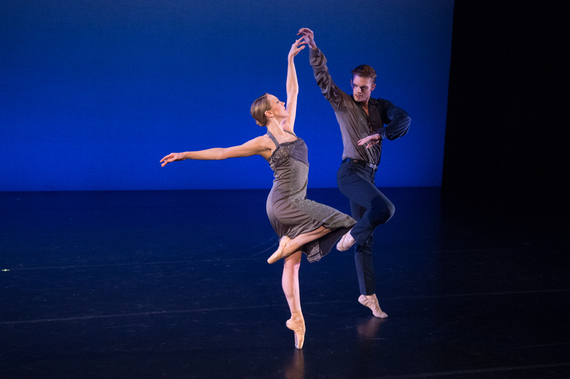 Crisp pointework and elegant, sweeping body lines responded appealingly to the ambrosial Fauré score, executed with chemistry of a different nature between pianist Michael Scales and cellist Amy Kang. Scales gave a brisk, unsentimental but sensitive reading of Chopin in the angst-ridden, introspective Such Longing by the masterful Richard Alston. Dancer Steven Melendez explored hidden depths of emotion in his solos and partnering work with the darkly glamorous Amanda Treiber, who possesses an eloquent backbend and a propensity for falling. 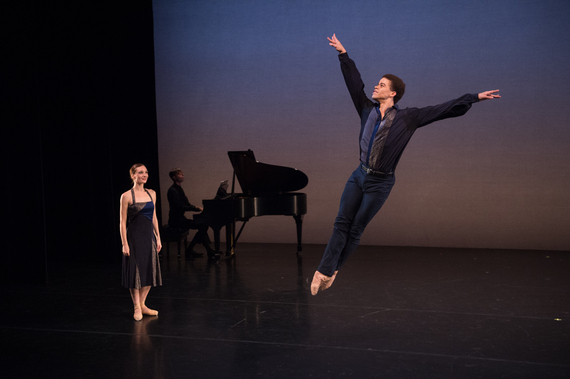 Theirs is not a joyful romance (perhaps one of them is married), and Melendez kept having to rescue Treiber as she swooned and plummeted - which made for an unusual and thrilling pas de deux. The union of Michael Wells and Elena Zahlmann, full of soaring lifts, seemed destined to end more happily. Though, on occasion, Chopin sparked the animated, expressive Wells to elegant fits of anger. Romantic entanglements notwithstanding, Such Longing is fundamentally a meditation on loneliness. Program notes mention the circumstances of Chopin's exile in Paris, and how he "poured all his feelings for his country into music" yet chose never to return to Poland. Antique Epigraphs, Jerome Robbins' masterpiece of quasi-Grecian restraint, looks divine at unusually close quarters. The exquisite restaging is the handiwork of Kyra Nichols, who graced the original 1984 cast. The intimate setting at NYLA highlights the fascinating individuality of the eight maidens conjured up by the magical flute of Mira Magrill. In this 'Night at the Museum' these austere figures of alabaster and bronze, clad in diaphanous tunics reminiscent of Isadora Duncan, come alive to the strains of Debussy. Elena Zahlmann warns sternly of some impending danger - the Cassandra of the tribe. Spitfire Mayu Oguri appears to seek vengeance for some unknown crime, tipping daringly off balance in her piqués. The noble-minded Amanda Treiber yearns for peace and harmony. As the women come whirling toward the audience, they suddenly seem transformed into winds. A soft classical languor pervades, at stray moments oddly yet beautifully inflected with angularity - at the wrists, the ankles, the hips. Dawn arrives, and in the miraculous gentle lighting (by Jennifer Tipton), the maidens line up, one hand on the next girl's shoulder, looking out to the wings. Their bodies assume the ghost of a curtsey, their faces enigmatically serene. The evening closed with a tumultuous 48-minute account of Philip Glass' suite of piano etudes arranged for steel drums. The 12-member NYU Steel ensemble took no prisoners. Neither did co-choreographers Steven Melendez, of New York Theatre Ballet, and Zhong-Jing Fang, of American Ballet Theatre. 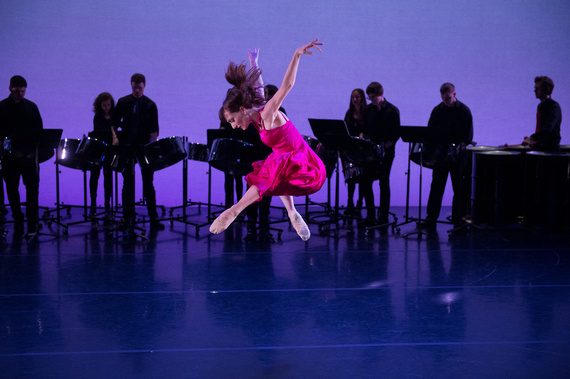 Silhouetted against the blazing cyc, smokingly lit by Serena Wong, surrounded by their massive gleaming black hardware, the musicians issued marching orders to the dancers, who stood facing the imposing drums, their backs to the audience. The musicians were clad in black while the dancers were attired in chic urban wear, by Sylvia Taalson Nolan, in shades of cement. The first few etudes, executed in a spare, striking vocabulary, merged the pedestrian with the dance-y, and suggested the isolation and confusion of millennials torn by conflicting expectations and ambitions. Then again, these may have been townfolk gathered at the edge of a prairie, witnessing, in shock, the landing of an alien spacecraft. Riveting, artfully planted movements conveyed the pulling of an emergency cord on a train, protective measures, angry confrontations, thwarted attempts to make emotional connections. A young man lurches forward - probably hung over - and butts his head despairingly against his friend's chest. They stand there motionless. Many of the encounters in this piece finish with a long drawn out freeze, as the shimmering sounds of steel rain down, sometimes wistfully, other times menacingly. 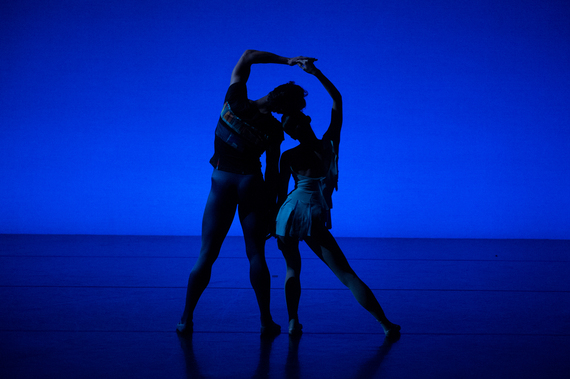 The choreographic instinct in these moments is sharp, as are the touches of wit and humor. Young women out on the town stumble across a sad drunk passed out on the sidewalk and matter-of-factly sweep him off into the wings. Three men negotiate a peace treaty, gliding powerfully around each other like figure skaters. Male-male partnering in one instance shows off powerful contact improv skills; in another, the men nod to Richard Alston, echoing a sequence from the central male-female pas de deux in Such Longing. Couples pose with gripped arms, the women in attitude, one leg lifted and arced behind them. To the beat of the pounding drums, the women alternately point and flex their lifted foot while the men lift and lower one heel - tiny but forceful responses to the merciless rhythm, a form of civil disobedience in the face of some pervasive oppression. Melendez, very fine in the Alston, was a firebrand in his own work. His split leaps, his engagement with the floor, his torment over having to choose between two gorgeous women, his compassion for a stricken friend were all etched clearly and boldly. Andino-Nieto and Wells, too, displayed tremendous grit and polish. Mayhem builds once the women change into bright silky cocktail gowns and the men into colorful shirts underneath their waistcoats and jackets. (Song before Spring is the title of the piece.) The minimalist dance vocabulary is replaced with a frenzied grab-bag of movement, to less compelling effect. Impassioned solos by Elena Zahlmann in scarlet and Amanda Treiber in hot pink (whose predicaments were maddeningly opaque), and a gripping display of female moxie by the trio of Alexis Branagan, Carmella Lauer and Mayu Oguri, provided oases in the general fracas that enveloped the final few etudes. Nevertheless, Song Before Spring scored an important triumph. The dance-makers put an arresting visual imprint on this relentless, epic score. They may not have conquered every corner of it, but they planted a bright, bold flag. Meanwhile, much of the ballet world is poking little cocktail toothpicks into the same platter of recycled works, and commissioning Hollywood-style blockbusters from a shrinking pool of name-brand choreographers. New York Theatre Ballet: Legends and Visionaries runs through Saturday, February 27, 2016 at New York Live Arts, 219 West 19th Street, New York City.